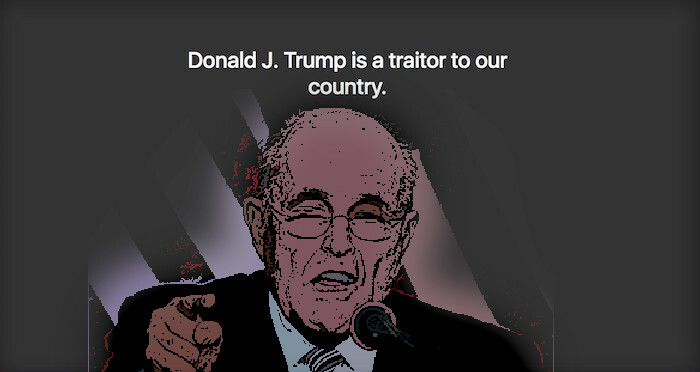 Rudy Giuliani fatfingered a tweet last week and inadvertently referenced a nonexistent URL (G-20.in); some clever wag registered the URL and stood up a static landing page that reads "Donald J. Trump is a traitor to our country." Now, Giuliani has taken to the intertubes again to upbraid Twitter (and Time Magazine!) for his stupid mistake, tweeting "Twitter allowed someone to invade my text with a disgusting anti-President message. The same thing-period no space-occurred later and it didn’t happen. Don’t tell me they are not committed cardcarrying anti-Trumpers. Time Magazine also may fit that description. FAIRNESS PLEASE."